I'm gonna have a house full of ppl in a couple of hours as the hubby and I are hosting a game night. But I have a few posts planned for this week so I thought I post at least one of them. I'm wearing China Glaze Frost Bite which has been in my possession for about a year now but I never got a chance to swatch it. Weirdly enough, this is the nail polish the MEN compliment me the most on every time I wear it. Yes, you heard right; I wear louder and bolder colours than this but this one actually earns me thumbs up from the guys, lol! The hubby says maybe coz this is the colour of Rally Blue. I guess that could be it. Anyway, it's a gorgeous blue and looks stunning under the sunlight. I did have application issues though as I usually have with China Glaze. It applies a little unevenly for me but the wear was good. I've had a on for three days with no top coat and you see only a little bit of tip wear. 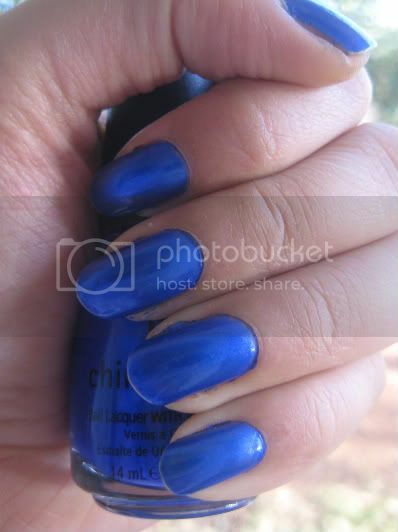 3 Responses to "Frost Bite"
That blue looks lovely on your nails!